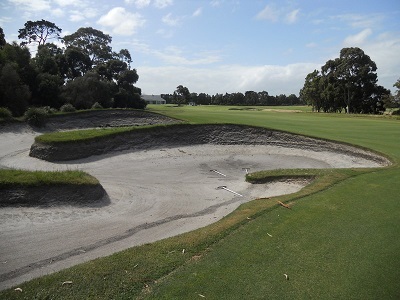 Does Kingston Heath have the best bunkering in the world? We’ve been all around the world in these travel blogs the last two months – South-East Asia, southern Africa, England, Scotland, Ireland, Canada and, of course, a few destinations closer to home in the US. One corner of the globe we haven’t visited yet, but one you will definitely want to if you wish to be considered a well-traveled golfer, is Australia. Saying you’re heading Down Under for a golf trip isn’t enough though. You really need to specify exactly where you’re going because, though Australia doesn’t have nearly as many golf courses as the States (just over 1,500 at last count), it is similarly gigantic - 2.97 million square miles compared with the US’s 3.74 million square miles. Perth in Western Australia, which everyone knows as the most isolated city in the world and which is actually closer to Jakarta in Indonesia than Sydney on the other side of the country, possesses roughly 50 courses including the fantastic 27-hole Joondalup designed by Robert Trent Jones Jr, and two excellent layouts at the Vines – Ellenbrook and Lakes - designed by Graham Marsh and Ross Watson. In Adelaide - the capital of South Australia – and the surrounding area, you’ll find the wonderful Kooyonga and Blackwood golf clubs and about 100 other courses including a superb Alister Mackenzie redesign at Royal Adelaide GC where, in 1926, the good doctor moved some rather flat and uninspiring holes into the nearby sand hills creating a course that regularly ranks among the top 100 in the world. Brisbane, the capital of Queensland, has its share of great courses too among the 70 or so you can play in and around the city. Greg Norman won the 1974 junior club championship at Royal Queensland where he worked under esteemed pro Charlie Earp. The club’s original course was designed, in part, by Mackenzie during his 1926 visit to the country, but the layout was altered so much in subsequent years, the members apparently weren’t too upset when the state government decided to purchase a section of the course in order to erect a new bridge spanning the Brisbane River. Australia’s Michael Clayton was hired to build the new course, and did a splendid job creating a layout that reflected the ‘understated, low-profile nature of the original that was influenced by Alister Mackenzie’. The Yorkshireman also made changes to Carnegie Clark’s original course at the lovely Brisbane GC in the suburb of Yeerongpilly. Sydney, as you’d expect of so eminent a city, is awash with great golf. If you can arrange games at the century-old, very private Australian and Royal Sydney golf clubs you’ll forge life-long memories, and you’ll not soon forget rounds at the Concord Club, Avondale in the suburb of Pymble, or the Marsh/Watson-designed Terrey Hills which opened in 1994 on the outskirts of the city in the Ku-ring-gai Chase National Park. If your schedule dictates you only have time for one round in Sydney, however, do your very best to make sure it’s at New South Wales GC in La Perouse, about ten miles south of downtown at the mouth of Botany Bay into which captain James Cook first sailed HMS Endeavour on April 29th 1770. New South Wales is a Mackenzie masterpiece which young Sydney designer Eric Apperly perfected in the years following Mackenzie’s departure. The club is extremely restricted and exclusive but, as with nearly all private clubs in Australia, the members are only too happy to share their magnificent course with visitors…at specific times on Mondays, Thursdays and Fridays. The only reason you’d spend so little in Sydney is because you’re eager to get to the Melbourne sandbelt where, as anyone with even the smallest appreciation of golf course architecture will tell you, Mackenzie created two of his very best – the West Course at Royal Melbourne which almost certainly appears in top-five lists of those fortunate enough to have played it, and Kingston Heath just a short drive east up Warrigal Rd. If you watched any of the 2011 Presidents Cup and heard the players’ comments, you know how great Royal Melbourne’s West Course is (the East Course, designed by Mackenzie’s partner in Australia Alex Russell, is pretty special too). And if you saw Tiger Woods and Adam Scott win the Australian Masters in 2009 and 2012 respectively, then you also know that Kingston Heath for which Mackenzie provided detailed bunker plans and one change to Dan Soutar’s original routing, might actually be better. Really, you could spend ten days just in the suburb of Cheltenham, 12 miles south of the city center, playing a world-class course every day. Yarra Yarra, Huntingdale, Commonwealth, Metropolitan, Spring Valley, Cheltenham, Kingswood, and Woodlands are all within five miles of each other. And, if they weren’t enough, there’s another world top-100 course directly between Royal Melbourne and Kingston Heath – Victoria GC whose magnificent bunkers, it will come as no surprise to learn, were the work of one Alister Mackenzie. Even this brief description of the amazing golf to be played in Australia will probably convince you one trip won’t actually be enough. Not even close. And even when you think you’ve got the mainland covered, you’re still not done. Thanks to Tom Doak and Bill Coore who built the brilliant Barnbougle Dunes and Lost Farm courses, the island of Tasmania will definitely need visiting too.